Scientists have finally achieved the dream of creating new life. Click here to play! Unfortunately, it's a Couch Potato that lazes around and watches TV all day. A walking talking vegetable, full of complex carbohydrates, that drinks beer, watches talk shows and eats potato chips all day. There's something super creepy about that last part, and the researchers try not to think about it too much. Nevertheless, despite their good-for-nothing lifestyle and frightening appearance, the demand for Couch Potato pets is quite high. With the right marketing, a factory farm pumping them out around the clock, and a few more trashy talk shows commissioned, there's a lot of money to be made from these awful Couch Potato creatures. 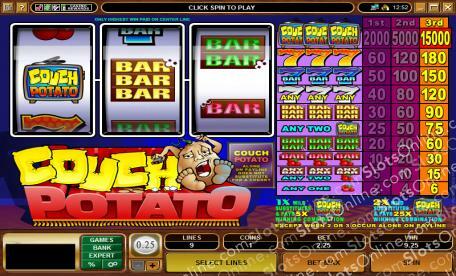 Enjoy making a fortune exploiting Science's gravest mistake in the classic 3-reel Couch Potato slots. With 7s, BAR symbols and red cherries, as well as a Couch Potato Logo symbol for the jackpot, these slots should be very appealing to anyone after a colorful and simple slots experience. The Cough Potato Logo symbol is wild, and substitutes for any other symbol. When alone on the payline, wild symbols do not equal a single red cherry or two red cherries, however. The wild symbol pays 5 times the prize amount when 1 is substituting for another symbol on the payline, and 25 times the prize amount when 2 wild symbol substitute on the payline.